Wow! Where to begin.. Alix was absolutely amazing and extremely attentive. 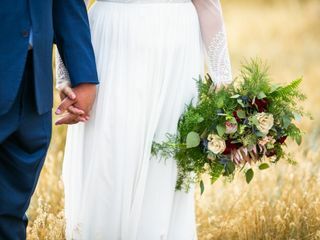 I first contacted Alix several months before our wedding, like super early on and from that same day, Alix responded quickly and provided me with all the information I needed. Being from Florida, I was extremely nervous on who I would hire to capture my wedding day but I knew Alix would be the perfect fit. Fast forward to a month before my wedding. Alix would constantly check up on me and the wedding process. Alix wanted to make sure everything would be perfect the day of and video chatted my (now husband) and I to finalize all details. Alix was all ears. The day of my wedding, Alix was on time and started her thang! I’ve never felt so comfortable (I’m a little awkward and camera shy). Alix and Connor were AMAZING!! All of our wedding guest complimented how great they were. Our wedding video turned out better than I could ever imagine. Alix and Connor, I want to thank you for making our memories last a life time. You both ROCK! Thank you so much for your kind words and for trusting us to capture your wedding day, Christina! We are so thrilled to hear that you both enjoyed working with us and that you loved the final videos. It was an honor to get to know you as well as your closest friends and family. Thank you for letting us tell your story! Amazing, every couple needs a video like this ! Working with Alix was great, easy communication, open to suggestion in regards to the style of the video and a fairly quick edit, we received our video in a little less than a month after the wedding. This video is one of my favorite things we decided to do. 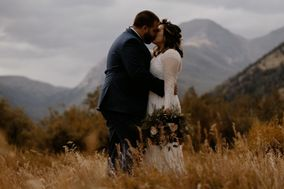 At first I was on the fence about booking a videographer, in the early stages of wedding planning with budgeting it can be one of the first things you cut.... but I’m so glad we didn’t! I feel like I am able to relive parts of the best day of my life and a video catches the authentic energy you just can’t with photography alone. Every couple needs a video like this, you won’t regret it. Thank you Sam! It means so much that you and Joel love your video so much and that you had a great experience as a client. I'm so grateful that I got to know you guys and be part of your wedding day! Alix Bruson Films was the best decision we made for our Wedding! 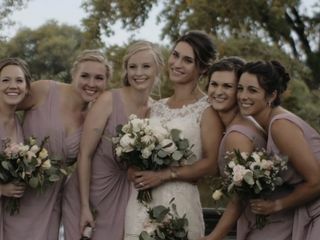 We can’t thank Alix Bruson Films enough for the beautiful wedding video they created for us. When I first called Alix we talked through what I wanted out of our wedding video, I talked through with her about how I wanted it to show love, family and friendship. 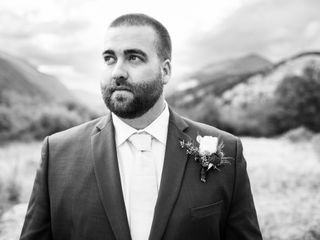 I also told her how my parents have passed away and that I was writing a letter to them in lieu of a program and that I would like that featured, she sat quiet for a moment then had the beautiful idea of using old family video in our wedding video. I was so excited I hung up the phone and called my fiancé and said we have to hire this girl. Not only are Alix and Connor incredibly comfortable to be around, they are both incredibly kind, thoughtful and an amazing talent. When Alix sent us our video we were speechless and just sat and cried watching how beautifully and thoughtfully she had put it all together. This is something we will treasure for our entire lives. Thank you is simply not sufficient, but thank you Alix Bruson Films for capturing our day more beautifully than we ever imagined, thank you for your incredible creative mind and for capturing the love we are so lucky to have not only together, but from those who surrounded us and those who raised me. If you are looking for a videographer hire Alix Bruson Films, I promise you will not regret it! Thank you so much Jodie and Ryan! We are forever changed by your story. It was a privilege to tell it and we are so happy that you're in love with your video! 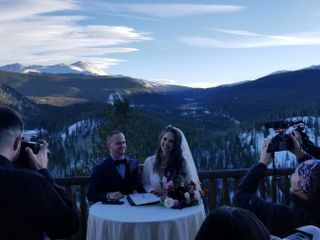 My husband, Michael and I are from Michigan and had a destination wedding in Estes Park Colorado. I felt so lucky to have had such an amazing couple capture our day. Our wedding day was our first time meeting Alix and Connor and they never felt like strangers. Each time I watch our video I get all the feels of the best day of my life all over again and I cherish that sooo much! And it’s all thanks to Alix and Connor! Have them capture your day, you’ll be so happy you did! Alix continues to thank me for letting her capture our wedding day, but all I can think about is how we were the lucky ones to have found her. Her professionalism and creativity surpassed what I hoped for and I can't say enough about how happy I am with the finished product! There was a very specific "vibe" I wanted everyone at our wedding to feel and Alix blew me away in how she was able to capture that in our film. I'm already daydreaming of projects in our future that she can capture! If your looking into hiring her look no further! Wow thank you so much John! I'm so happy you and Taylor love your video so much, and I would absolutely be down to document any life events for you guys in the future! Alix & Connor definitely exceeds our expectations and more! We chose to have a photographer later on in our wedding planning process and we are so happy we found them! From the moment we met them they made us feel so comfortable, capturing moments we didn’t even know they were around to capture! We are in love with our video and would recommend them over and over again! Thank you so much Jennifer! We will never forget your amazing wedding day and we feel so blessed to have gotten to know you and Zach and your incredible friends and family! FIVE STARS IS NOT ENOUGH. Alix and Connor were incredible. She not only made the most beautiful video, she made it ours. We have been watching her videos for months and months. All unique, different, and wonderful. And the second we saw ours, it all was very clear how INCREDIBLE she is at getting to know the core of who you are, and making a video that truly speaks to you as a couple. Thank you so much for the kind words Garrett! I am so grateful that you and Molly chose me to tell your story, and that you feel the video is true to who you are as a couple! Let me back up, first of all my husband (!!) 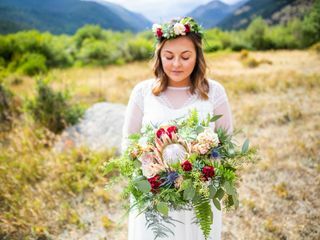 and I won our wedding through a contest a venue in Colorado was giving away a wedding for free (yes, free). So when we were chosen, we were shocked and stoked beyond belief; however, while the venue provided almost everything (flowers, food/drink, photography), the only thing that was missing was a videographer. I had often heard my married friends express their one regret of their wedding was not getting a video. So, I knew I had to have one. Well being that we dont live in Colorado, we had no idea where to start. Luckily, my wedding planner suggested Alix, I have no idea how she found her, but I thank my lucky stars that she did. Not only was Alix totally cool with covering our wedding with less than a month's notice, for a couple she had never met or heard of, she also did it pro bono for us, simply because she loved our cool story. We talked all of one time with Alix, two days before the wedding. She asked us what we wanted to feel when we watched our wedding video, I of course said I wanted to cry, my husband of course said he wanted to laugh. What kind of music do you like? we answered with "anything." Good luck trying to meet that super specific criteria, right? Well as unhelpful as we were, Alix managed to not only deliver, but she exceeded our expectations. Now to be completely honest, Alix totally could have done the bare minimum since she was doing this as a gift to us, but I am convinced she went above and beyond for us. It literally is the perfect blend of heartfelt and emotional, but yet it always leaves me genuinely smiling and I feel punch drunk with happiness when it's over. It is literally the best wedding video I have ever seen, yes I am biased, but everyone tells me so as well, and does it really matter what everyone else thinks when you and your husband are deliriously happy with the 4 minutes of perfection which allows us to relive our favorite day, everyday? We chose to hire Alix for our wedding videography because we fell in love with her previous work. Once we set up a phone call and talked through details, we knew we had to work with her! She was so professional throughout the entire process and very responsive to questions. During the wedding, they shot footage of us getting ready, the ceremony and the reception. The final video is honestly more than we could have ever expected, and shows a memory that we will be able to cherish forever. We are moved to tears every time we watch and are so thankful we chose to work with Alix. We would HIGHLY recommend Alix Bruson Films to everyone!